An e-bike that utilizes a ContiTech drive system. HANOVER, Germany—ContiTech A.G.'s Power Transmission Group has taken over Benchmark Drives GmbH & Co. KG, a developer of e-bike drives, to expand its presence in the e-bike and pedelec bike market. 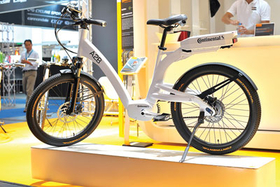 Benchmark Drives, which was formed in 2010, “has outstanding development expertise in the field of e-mobility and has excellent contacts with bicycle manufacturers,” according to Konrad Mueller, who heads the ContiTech Power Transmission Group business unit. He said that with the takeover, the firm is strengthening its position in the market and gaining quicker access to bicycle manufacturers. ContiTech has been developing drive systems for bicycles, pedelec bikes and e-bikes with Benchmark Drives for a long time, the company said. E-bikes and pedelecs are basically electric bikes with small motors. Last year, the companies came out with a complete drive system for e-bikes and pedelec bikes—comprised of a motor, display, control unit and rechargeable battery—that's smaller, more powerful and lighter than other products on the market, it said. The two companies have been selling another product, the Conti Drive System, since 2012. A drive technology for bicycles that uses a timing belt rather than the usual chain, the system eliminates oil lubrication and is service-free and environmentally friendly, ContiTech said.